Whenever I’m visiting my hometown Hamburg, I check out new bakeries. Two years ago I noticed people lining up in front of Bäckerei Jochen Gaues, in Eppendorf quarter, where my Mom lives around the corner. Taking this as a good omen, I joined the waiting line. 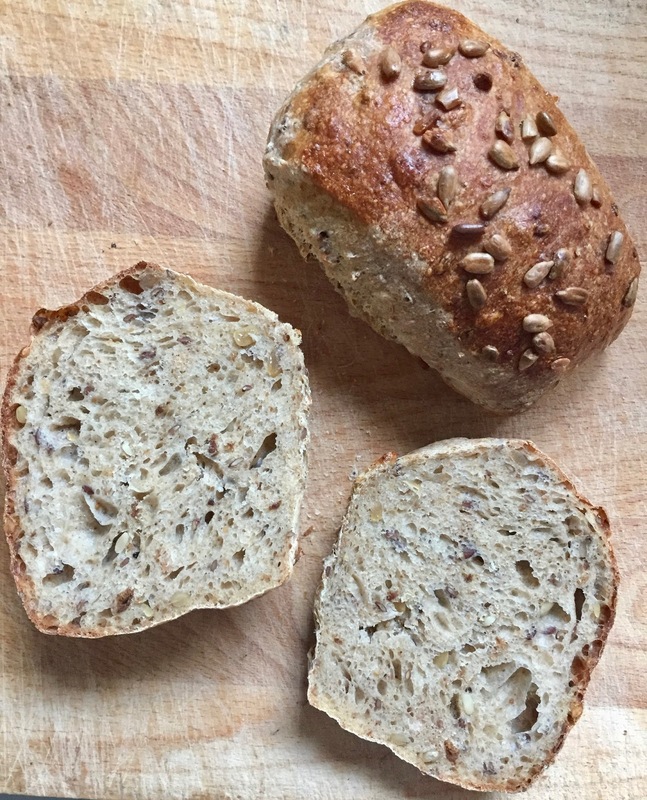 The shelves full of loaves and rolls looked promising, all with fairly dark crusts – boldly baked, as Ken Forkish (“Flour, Water, Salt and Yeast’) would call it. A paradise for crust lovers! 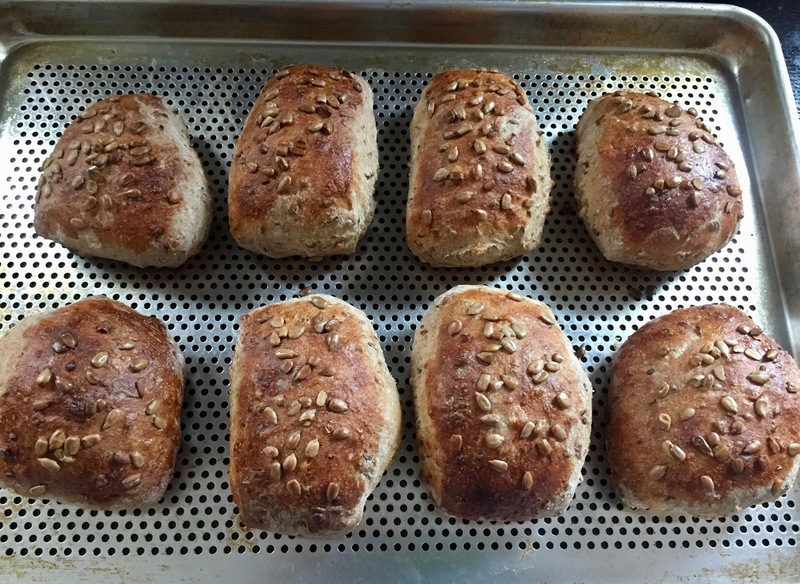 Like Forkish, Jochen Gaues is a purist baker, his breads are made with flour, water, salt and yeast. No dough enhancers, no preservatives, no artificial flavoring. Only sourdough and passion for his craft. And he shared his recipes in a beautiful baking book, too. 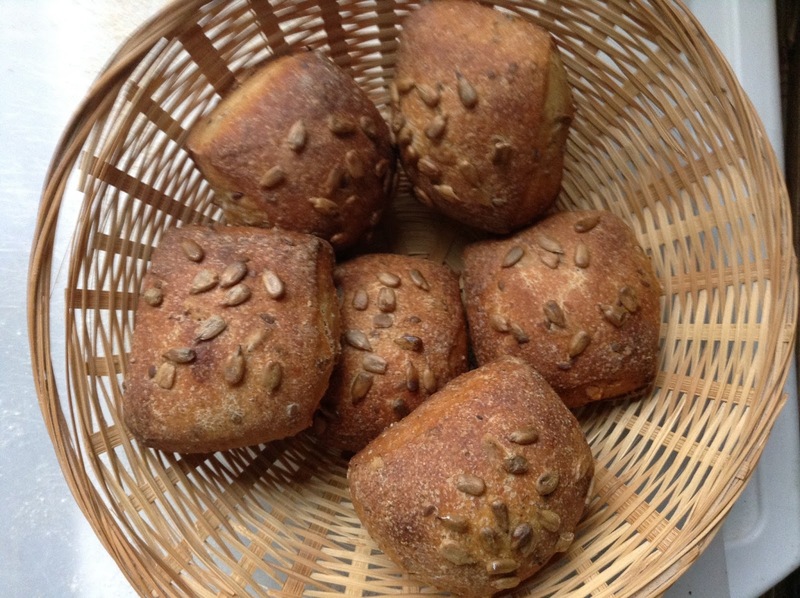 His sunflower seed rolls are hearty, crusty and delicious. (I tweaked the recipe a bit, of course, as I always do). The crumb is rather light and more airy than chewy. You can enjoy them with cold cuts, German meat salad, honey or jam. In the morning, mix starter ingredients in small bowl. Leave, covered, at room temperature for 4 – 6 hours, or until it passes the float test (a teaspoonful should float in water). 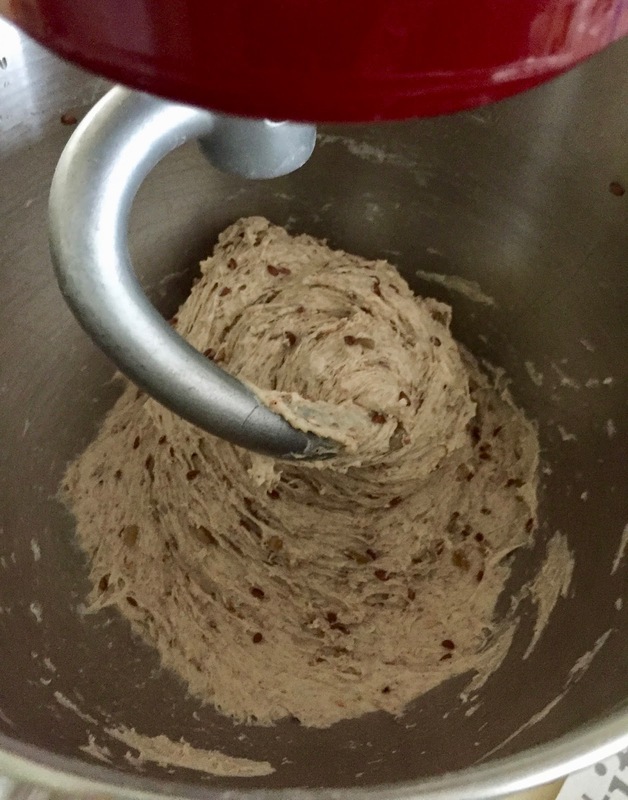 In the afternoon, mix final dough at low speed until all flour is hydrated, 1 – 2 minutes. Let dough rest 5 minutes, then knead at medium-low speed for 6 minutes. Dough will be soft and sticky, but pull back from sides of bowl. Transfer dough to lightly oiled work surface. With oiled hands, pat and pull it into a rough square. Fold dough from top and bottom in thirds, like a business letter, then the same way from both sides. Cover dough package with the empty mixing bowl (if necessary, re-oil works bench). Let it rest for 10 minutes. Repeat stretching and folding the dough 3 more times, at 10 minute intervals. It will gain strength and starting to resist. 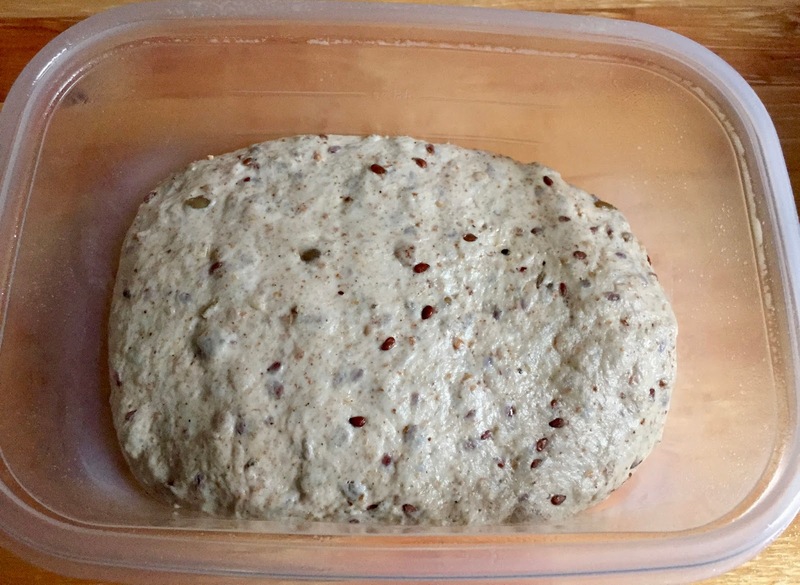 Place dough in oiled container, cover, and refrigerate overnight (a square container helps with shaping later). 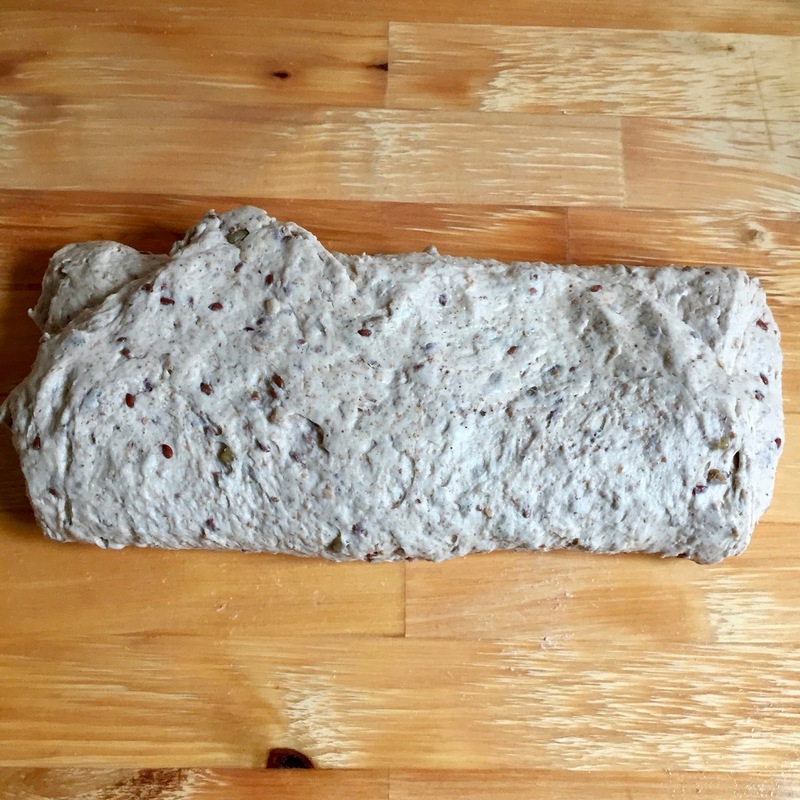 Remove dough from fridge 2 hours before using. It should have doubled in volume. Preheat oven to 475ºF/240ºC (no steam). 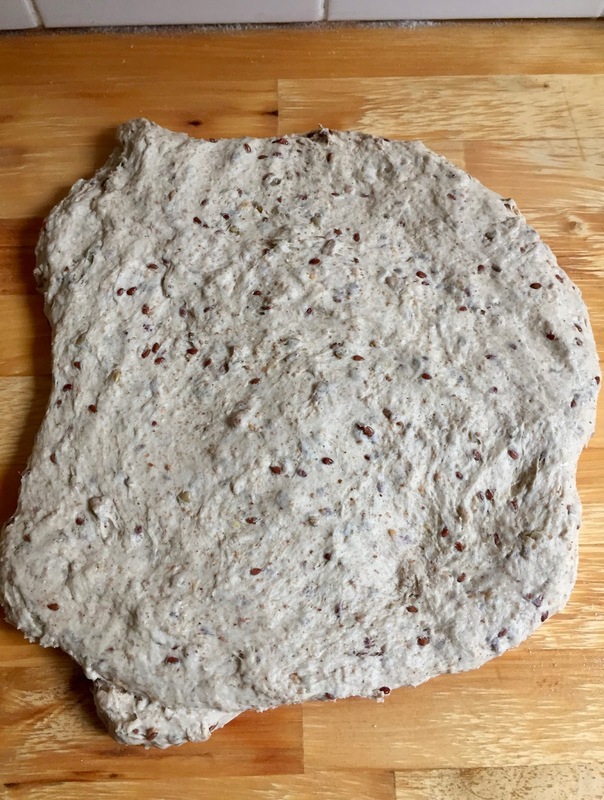 Place dough on a lightly floured work surface, sprinkle with a little flour (it will still be a bit sticky), and gently pull and pat it into a rectangle, then cut into 8 square pieces. Place squares on parchment lined (or perforated) baking sheet. 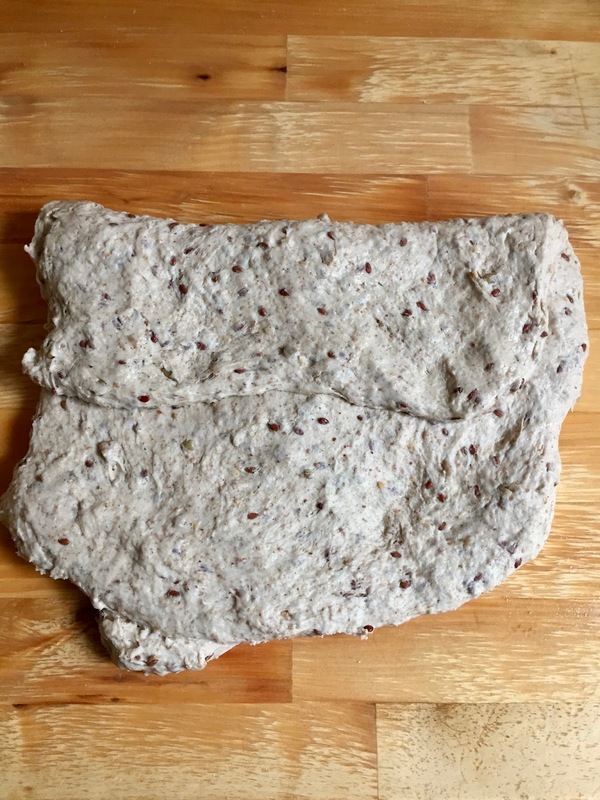 Brush rolls with egg white, then sprinkle each with sunflower seeds, gently pressing them down to stick. Cover, and proof for about 25 – 30 minutes, or until a finger-poked dimple remains visible. (Since the dough is cut, not shaped, it is puffy and doesn’t need to rise much more – basically only until the oven is hot). Bake rolls for about 20 minutes (rotating them halfway through), or until they are a dark golden brown, and register at least 200ºF/93ºC on an instant read thermometer. BreadStorm users (also of the free version) can download the formula here. Next Post GREY GARDENS COCKTAIL – SERVED BY "VAL"
Let me know know how you like them, Philip, they taste really good. And I like the idea of using old bread in the dough. Hi Karin, I just got around to trying these and they were amazing! One of the best breads I've made. 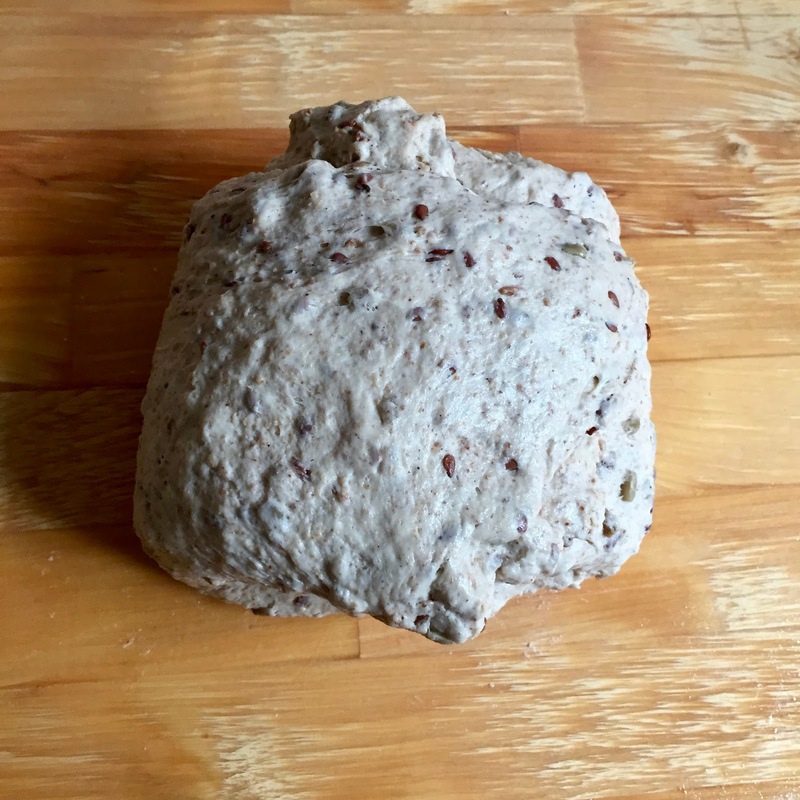 I made a lot of substitutions based on what I had at home: whole rye instead of medium, flax meal instead of seeds, rolled rye flakes instead of cracked rye, pumpkin seeds instead of sunflower, and finally, 11% protein AP flour instead of BF, adding an extra 25 grams to get the pictured dough consistency. The dough came together exactly as described and baked up in only 20 minutes for me, though my oven probably ran hot as I had to tent the rolls so they wouldn't burn. Fantastic, flavorful, ever so slightly chewy rolls, and I love the convenient schedule and unfussy rustic square shape. I imagine they'd be even better with stronger flour. Thanks, Mathan, I'm glad your rolls turned out so well. Yes, you can play around with the ingredients, Gaues offers two variations that are both very nice, too. Cutting the dough instead of shaping is really no fuss at all. It's just barely getting warmer, and the crocuses are out. I'm sick and tired of winter! I tried 3 times to make the rolls according to the recipe. The dough comes off wet, very sticky and difficult to shape. The taste of the baked rolls is fantastic though! 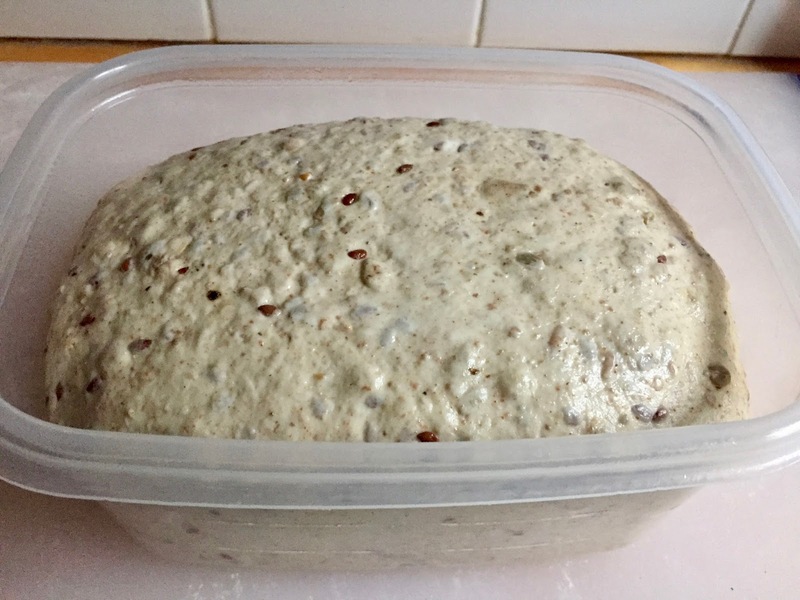 The ambient temperature in my kitchen is 30 – 32 C all year, so I keep the dough in the fridge except for the brief moments I turn the dough as instructed. 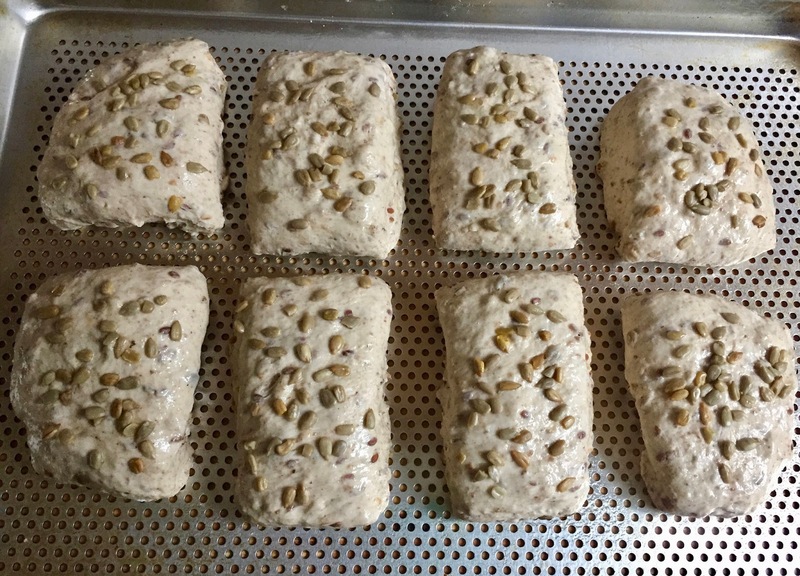 I have tried to add more flour (500 gr) and to add the Roggenschrot and flax seed without first soaking. 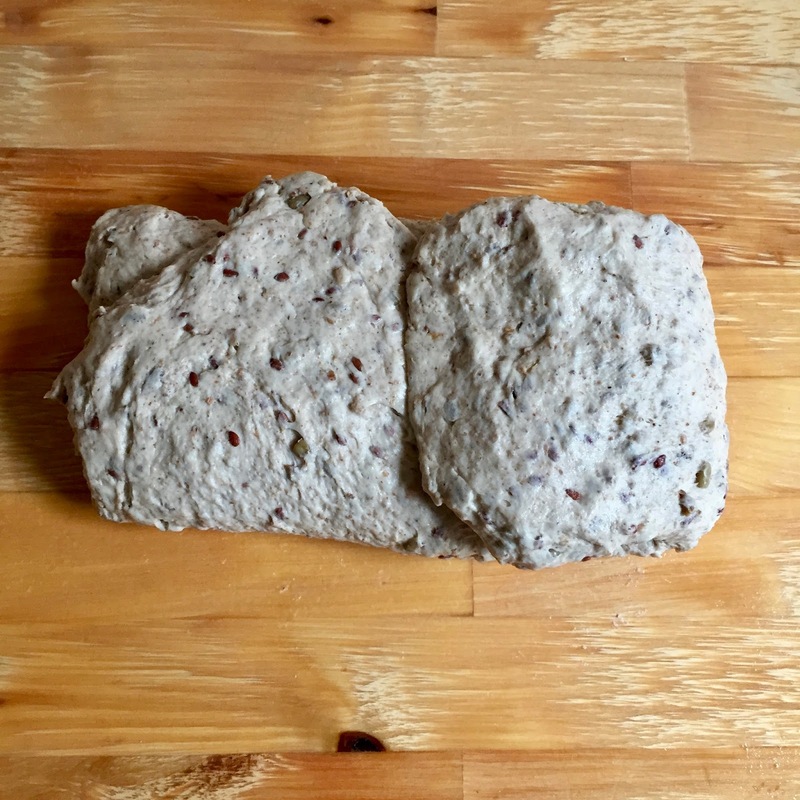 I am using King Arthur bread flour. 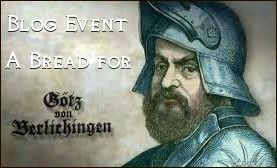 Can you think of something? Add less water? More flour? 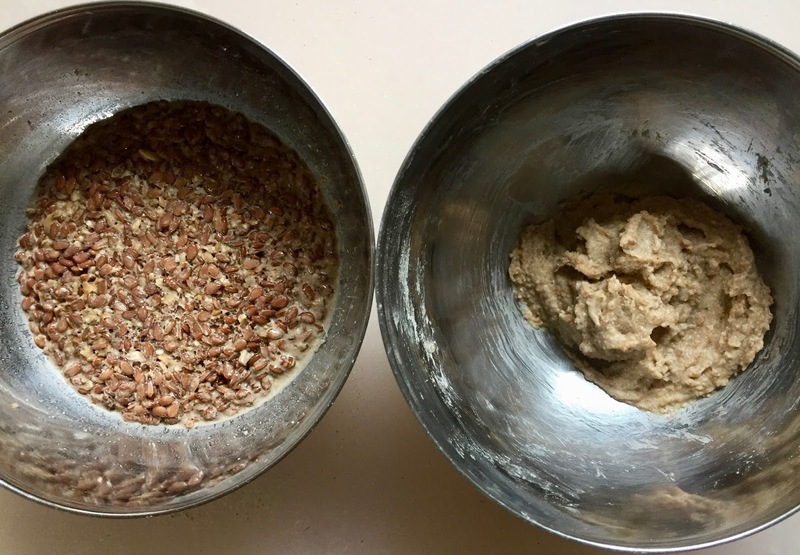 What is the consistency of the dough when mixed by you? Does it cling to the bottom of the mixing bowl? Hi, John, yes, the dough is quite sticky, and therefore only cut into squares instead of shaped into rolls. The dough releases the sides of the bowl, but does still cling to the bottom. Handling it is a bit of a challenge, you have to oil, or flour, your hands, and cut the dough on a well floured work surface. 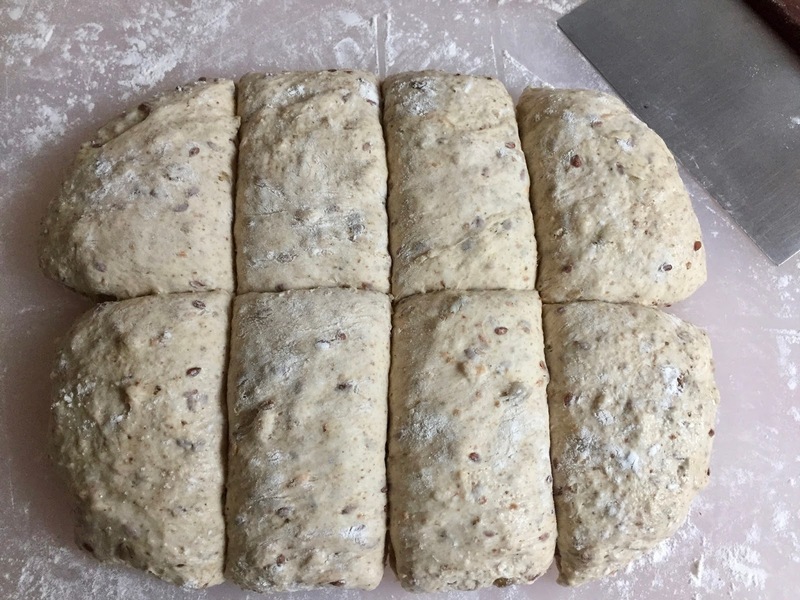 I sprinkle the division lines (where I intend to cut the dough) with a bit of flour so that the bench knife does not stick. The extra flour on the work surface does not get incorporated into the dough, it only helps with the sticking. You can, of course, use less water in the dough (I would add more flour), but the rolls will be denser.